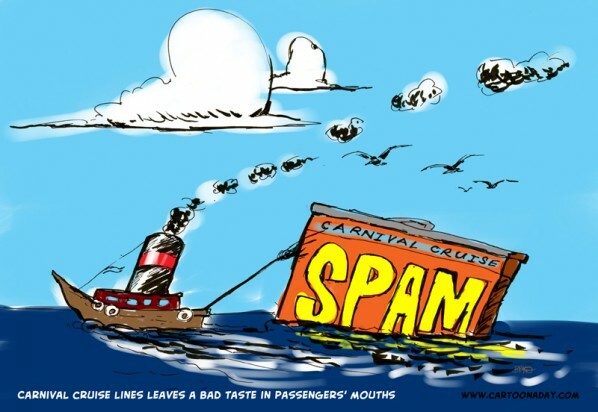 You thought the SPAM in your inbox was bad, stranded passengers of a Burnt and Broken Carnival Cruise Ship were air-dropped SPAM in a can from the U.S. Military. If you’re not clued in, the Carnival Cruise ship, underway and conducting a passenger cruise off the coast of Mexico with 4,500 passengers, had engine trouble resulting in a fire. The fire was controlled and extinguished, but not before it rendered the Cruise Ship without power. Adrift, the vessel is being towed to home port in San Diego by a tugboat. Without power for food preparation and other sanitary facilities, the U.S. Military (Navy aboard the USS Ronald Regan) airlifted SPAM mystery meat to the stranded guests and crew. Here’s the full scoop over at USA TODAY. A carnival Cruise ship, adrift, is rescued by a tugboat pulling it to safety. The ship appears as a floating can of SPAM.